QUBES - Blog: Reflections on the QUBES/BioQUEST Summer Workshop - a future faculty perspective (third of a series). You are here: Home / News and Activities / Blog / 18 / 10 / Reflections on the QUBES/BioQUEST Summer Workshop - a future faculty perspective (third of a series). Four highly motivated future faculty volunteers attended the 2018 QUBES/BioQUEST Summer workshop. Over the next couple of months, they will be sharing their experience with the QUBES Community in a series of blog posts. Lillian Senn and Mark Slabodnick shared their experience with the QUBES Community in the first and second posts in this series. Below, future faculty and guest blogger, Jenny Hazlehurst, discusses her experience at the 2018 QUBES/BioQUEST Summer workshop. I learned that my degree came with choices. Of course, I always knew that there was more than just the tenure track research faculty job out there, but now I had to CHOOSE. I decided I probably wanted to be somewhere that emphasized teaching, but that still allowed me to involve students in scientific research. That’s when I found the QUBES website. I participated in one of their Faculty Mentoring Networks, and had a very positive experience. When the opportunity came up to apply for a Future Faculty spot at the QUBES/BioQUEST “Wicked Problems” workshop I immediately applied. What I gained most from attending the workshop was community. I was also finally able to narrow down those job searches to faculty positions that emphasized student-centered scientific teaching and research. Attending the workshop gave me the tools, language, and human support I needed to refine my career goals and prepared me to be a better teacher. The experience was illuminating, eye-opening, and fun. I learned about Universal Design for Learning principles through daily scenarios which faculty from all over the country and from different types of institutions brainstormed in groups. We came up with some very creative UDL designs, for example using GoPro cameras carried by students on field trips to natural areas with rough terrain to allow classmates who could not get to field sites to experience them and participate in the learning. In one exercise, I worked with faculty and students I had just met to develop a case study about the water crisis in Flint, Michigan suitable for an environmental sciences course. We were offered workshops in a wide array of teaching tools to encourage quantitative skills, including Shiny apps and Swirl lessons in R. The workshop culminated with workshop participants organically coming together around self-identified projects. During this part of the workshop, our group was able to design a Shiny app for teaching statistics while alleviating math anxiety (see Cats Teach Stats). Many months later, this collaboration is still active, and we are presenting our tools at the upcoming NABT conference. Another singular experience I had at the workshop came through conversations with attending faculty that challenged me to see that many of the ways that I had been taught science, and the ways that I had taught science in the past, were restricted to a European, male perspective. I learned to be unafraid of shaking those structures up and rebuilding them in ways that embraced more perspectives with the goal of encouraging students from underrepresented groups in STEM – a “Wicked Problem” as the remarkable keynote speaker Dr. Talithia Williams noted – to feel engaged and empowered by the course material. The sense of community and the empowering experience of developing lessons and teaching tools in a friendly, collaborative atmosphere at the QUBES/Bioquest workshop came at a critical point for me. It was a truly transformative experience that has helped me to develop a clear vision for where I want to go with my faculty career. I cannot recommend the Future Faculty program enough to people transitioning from school to teaching careers. 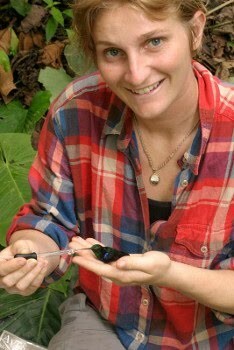 Jenny Hazlehurst earned her Ph.D. at Tulane University in Ecology and Evolutionary Biology. She is currently a postdoc at the University of California Riverside studying hummingbird migration and plant-pollinator networks in California ecosystems. She also teaches biology labs at Riverside City College and organizes informal STEAM (STEM + Art) education events for kids through the local public library system. After her postdoc, she hopes to pursue a faculty position at an institution that emphasizes student-centered learning and student mentorship in independent research. The 2019 QUBES/BioQUEST Summer Workshop, titled Evolution of Data in the Classroom: From Data to Data Science, will be held at the College of William & Mary in Williamsburg, VA on July 14-19, 2019 and will focus on Data Science for Undergraduate Biology Education. If you are interested in attending, we encourage you to sign up for updates on the 2019 QUBES/BioQUEST Summer Workshop here.